Suitable for use all year round. With solar controlled energy efficient glass. Low maintenance and built to last. Requiring virtually no upkeep. Tailored to your needs. With a range of styles, door and glass options. "SMART cement grey lean to conservatory"
Ever-popular Victorian style conservatories have an elaborate design with three or five facets on its bay-style front, along with ornate detailing on the high pitched roof. 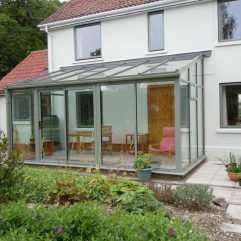 Victorian conservatories complement all styles of properties and can be easily adapted to suit the space available. All our staff are employed by us – no pushy sales people and our own friendly, experienced fitters. Are you interested in one of our Victorian Conservatories? Then contact us today to discuss your requirements for a free no obligation quote.